1. The 3rd generation iPad has a higher resolution screen than the 1st and 2nd generation iPads. The resolution is 2048x1536 instead of 1024x768 (or four times as many pixels total). Because the screen remains 9.7 inches diagonally, it means there are more pixels per inch (264 ppi vs 132 ppi) -- so many pixels per inch that your eye is unable to distinguish individual pixels at normal viewing distance -- hence the expression "Retina" display. 2. The 3rd generation iPad is faster than the iPad 2. It has a Dual-Core A5X with more "oomph" than the Dual-Core A5 processor. A Quad-Core graphics processor replaces the Dual-Core graphics processor. How much more "oomph"? 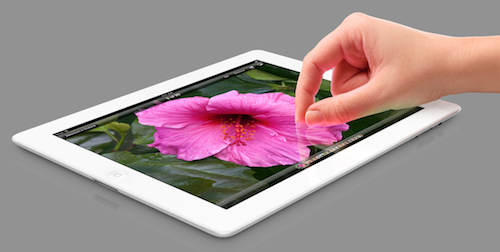 We will publish benchmarks as soon as we get our hands on the newest iPad. 3. The 3rd generation iPad transfers data faster than the iPad 2. You can order it with the 4G LTE wireless broadband option. The Verizon 4G LTE connection in our town has been measured as high as 22 megabits per second download. That's four times faster than the best HSPA+ AT&T network connection in our town. Also you can use the new iPad with 4G LTE option as a mobile hotspot for other devices. No contract is required. The WiFi only model has not changed in speed. It's still 802.11n. Transfer speeds depend on the data connection on the backside of the WiFi hotspot. With our lab's Comcast cable modem connection and AirPort Extreme Base Station, we typically see 34 megabits per second downloads on the iPad 2. 5. The 3rd generation iPad has the same battery life as the iPad 2. It runs for up to 10 hours on WiFi and up to 9 hours on cellular networks. For full details on Apple's 3rd Generation iPad, visit the product page. 1. The iPad 2 or original iPad may be adequate for your needs and are certainly less costly whether new, refurbished, or used. 2. We take most of our still photos and videos with an iPhone 4S. Though the new iPad's backside camera is improved, we will likely continue to use the 8MP camera on the iPhone 4S for stills. However, for shooting video, the new iPad is compelling since the larger screen gives you a bigger preview of your shot.